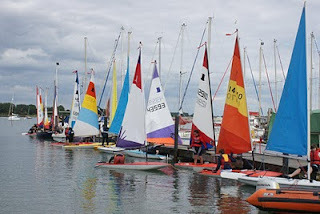 A colourful view from Thornham’s pontoon as the Toppers from West Wittering Sailing Club Juniors made their way to Prinsted house for lunch. Many thanks for letting us use the pontoon for our Junior Cruise. With such a high tide it made things a lot simpler than mooring up to a Rib and furling all the sails! The cruise was the fourth day of a week's sailing for juniors at West Wittering Sailing Club. The idea was to give the most confident of our young sailors a taste of a real destination sail - using their skills to take them from one harbour and back - so that they could say they'd really been somewhere. A sort of Swallows and Amazons experience you could say. The passage to Prinsted was an ideal choice as the prevailing westerly’s we'd been getting makes this a fairly easy sail without too much tacking, whilst avoiding the main harbour in which Federation Week racing was taking place. Some 14 Toppers and Picos helmed by 10-15 year olds left East Head at about midday accompanied by parents in a RIB, WWSC's committee boat, plus a couple of cruising Day Boats and for good measure a Weta trimaran. By the time we'd got to Pilsey the wind had risen to a fresh north westerly of about 15 knots and several of the lighter helms were glad of the reefs they'd put into their sails at East Head. There were also a couple of capsizes though none that required any assistance. The leg up to TISC required a number of tacks with the lead boats being asked to circle the Star first then Stanbury to avoid the fleet getting too spread out. With the exception of David Swayne's Snowgoose most of the fleet chose to ignore Adrian's careful instructions about following the goal posts up the channel into Thornham. Perhaps it was lucky that it was one of the highest tides of the year! With no beach at all underneath the sea wall it was a relief to be invited to tie up our boats on the pontoon and then make our way up to Prinsted House for a well earned sandwich and ice cream which Adrian and Honor provided. Eschewing other offers of refreshments the party quickly embarked with an eye on the ebbing tide - Snowhill Creek only offers 2 hours of navigable water either side of high water. The trip back was a delight; wind behind us, tide with us and glorious sunshine sparkling on the water all the way back to East Head. For our young sailors, some of whom had never ventured beyond East Head, there was a deeper sense of satisfaction and achievement. They'd completed a challenging sail up to the top of the harbour in conditions just within the margins of their ability, proving new found skills to themselves and to their parents. And perhaps most importantly of all discovering the sense of fun, independence and adventure that sailing offers us all. Sign up to our new Twitter account and receive hourly up-dates of what's happening at The Marina!